Re-creating the experience and atmosphere of tramway operation from an earlier generation. 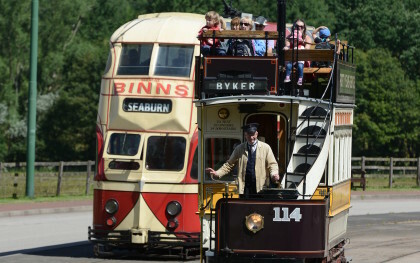 Beamish Tramway, opened in 1973, serves to re-create the experience and atmosphere of tramway operation of an earlier generation, whilst providing an essential means of transport for visitors around the site. As well as the electric trams, there are replica Edwardian motor buses and, part of the present development plans, trolley buses and motor buses to increase access around the site and serve the new 1950s developments. The original 1973 route comprised a single track from the Depot at Foulbridge to the boundary of the Town site. This was extended into the growing Town in 1975, and then extended beyond Foulbridge to the new Visitor Entrance in 1988, bringing the route to a mile in length, with passing loops at all three stops. Then in 1993 a major extension completed the circle from Town via Pockerley (with a further passing loop), up a steep gradient through Birch Wood, back to the Visitor Entrance, this completing Route 1. Route 2 serves the Colliery (Pit Hill) and is operated by replica buses from the Edwardian period. The proposed trolleybus route will run largely in parallel with the tramway, except for a divergence into a 1950s bus station and through parts of the 1950s urban developments. This route will be operated by both motor and trolley buses. The distinctive poles supporting the overhead have all been recovered from former tram and trolleybus systems, in many cases restored to their original length by specialist welding. They are set in concrete to a depth of about 2 metres. The trolley wire is grooved copper alloy, 4/0 gauge (80 sq. mm), suspended either from bracket arms or on span-wire construction, at a normal height of 6 metres. A second (negative) wire is provided in the Depot area, for safety earthing purposes, and for test-running the trolleybus. The trams are all fitted with trolley poles and carbon-slipper trolley heads, and return their traction current via the running rails. Overhead fittings have been salvaged from the Newcastle, South Shields, Tees-side and Bradford systems, and in the Town area period fittings have been used wherever practicable. Trams use a single wire with the negative route via the rails, whilst trolleybuses use a pair of wires, the negative being one of this pair. The Depot is located within the Foulbridge workshop complex and includes accommodation for trams on four roads (1, 2 3 and 4) and for cars, buses and trolleybuses on roads 4 and 5. Road 3 is equipped with an inspection and service pit. Mechanical and Electrical workshops and Stores provide the facilities for routine maintenance, repairs, overhauls and complete restoration work, not only on the vehicles but also on the track, power supply and overhead line system. Although much of the work on the trams is carried out on site, some specialist work such as traction motor overhauls and wheel re-profiling is undertaken off site by local contractors. The Depot also houses the substation and telephone exchange. Future expansion includes construction of a dedicated bus depot, extension to the existing tram depot and creation of enhanced servicing facilities and a vehicle wash bay. The operating fleet usually consists of between four and six trams, with others in store or undergoing heavy maintenance. The fleet is now being put into an approximate 7-8 year cycle which sees their intensive maintenance followed by a body lift to allow the motors to be overhauled. There are two Edwardian replica buses based on the London B type (in Newcastle Corporation livery) and a Northern General Daimler. A 2007 built accessible bus provides wheelchair access. A 1932 Leyland Cub is presently being restored to carry additional wheelchairs, and this will be followed by a further Leyland Cub in 2017. At present there is one working trolleybus, Newcastle 501, but this will be supplemented once the development of the trolleybus route begins from 2016. An Armstrong Whitworth replica car is also available as a limousine, and a supporting fleet of cars and vans dating from the 1920s to early 1960s can also be seen at work around the Museum. 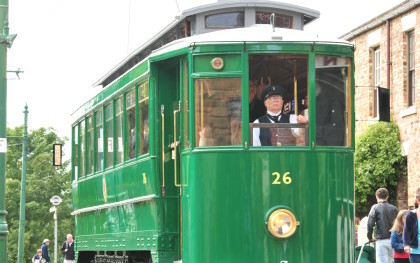 This unique opportunity allows you to drive one of Beamish's fleet of beautifully restored trams, travelling around the 1 1/2 mile circular track. 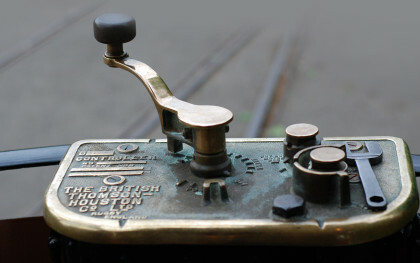 This unique hands-on experience allows you to take the controls of a Beamish tram around the 1 1/2 mile circular track. Take a behind the scenes look at our Transport and Industry collection as our Keeper of Industry takes you around the areas of Beamish not on view to visitors.